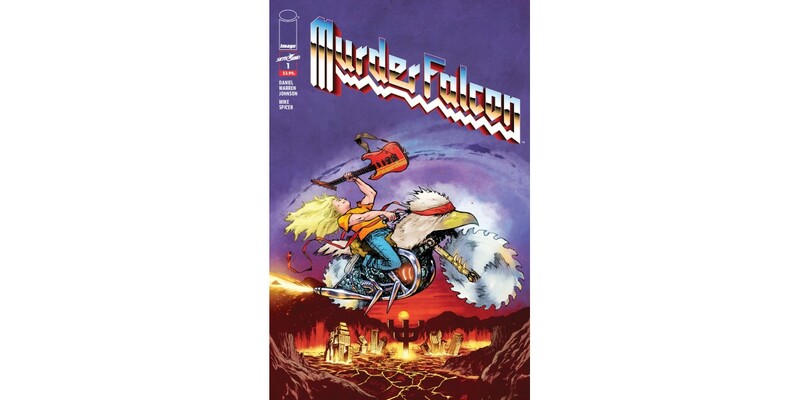 PORTLAND, OR, *|MC:DATE|* — Image Comics and Skybound Entertainment are pleased to reveal the first “Heavy Metal” variant cover for Daniel Warren Johnson’s MURDER FALCON. Each issue of the head-banging action series will feature a “Heavy Metal” variant cover that pays tribute to a different classic heavy metal album cover. A variety of brutally talented artists will contribute to this variant cover line, kicking off with series artist Daniel Warren Johnson on MURDER FALCON #1 Cover B.